I’ve been so busy painting for people that I haven’t had much time to spend in the shop. That all should change soon since I’m planning on taking off from painting for a while. The other day I did have a free day that the boys were both in school and I kept seeing this empty space in the kitchen that I thought needs a little something. I’ve also been wanting to add curtains on the windows around the table so I set to work to try and spruce things up a bit. I made a little table that is just right to use for the computer. The old window and stool I found at a local antique mall. (window- $1.00 and the stool- $9.00) The one pane in the window was missing so I added a corkboard and the other one I painted with chalkboard paint. I painted the stool a dark brown and distressed it. I even got a little help with the table! After giving the table a coat of off white paint, I rubbed some dark brown on it and wiped off giving it an aged look. I also sanded the edges before applying the dark brown. After the paint dried I gave it a coat of varnish. I bought this fabric at a local outlet store for $5.95 a yard. I got two yards and had plenty left over. I’ve never been too much of a curtain person but so far I’ve liked the look in the kitchen. I thought with the curtains and a rug beneath the table it completes the dining area. This rug comes from one of my favorite stores in Berlin – Olde Thyme Country store. The center piece now ( which gets changed quite a lot ) is a lantern from P. Graham Dunn. I can’t remember where I got the berries. The mirror comes from Walmart. These days I am really battling with spring fever…after all, it’s just around the corner!! I spend a lot of time doing this.…. Finally, I am getting around to posting a tutorial on redoing cabinets. I know there are numerous ways to go about with such a project but I will show one way that I used recently that seems to work well and is relatively easy for anyone. I have since learned to use my sprayer for every step and found it to take a lot less time and give a more even finish. When using the right rollers and paint formulas, basically the same effect can be reached without a sprayer. Following are a few snapshots of a new piece of furniture that I painted for someone using the same method as the kitchen cabinets on this post. The first thing to do when starting a paint project is of course to decide what color to go with. I usually carry samples with me to show people some of the more popular cabinet colors. The samples consist mostly of about five different colors of tan ranging from almost white to a deeper tan and a black one with red showing through. All my neutral samples are distressed with dark brown showing through at the edges. The first thing to do when starting a kitchen is to take all the doors, drawers and hardware off. I’ve always only painted the outside of the cabinets which saves you from the hassle of removing everything that is on the shelves. The drawer contents would of course need to be taken out. Step 1: Since I despise sanding, I opt to use a deglosser instead. ORMEs hardware in Berlin is where I get most of my paint and supplies. They carry Krud Kutter, which I rub onto the wood to get rid of some of the gloss and also any dirt that is on the cabinets. If the cabinets are dull already, I omit this step. Next, I apply a primer. Zinsser 123 primer can be tinted, which I like to have as dark as possible. These little rollers are great! The next step is a little more complicated because to get the best results I have a few additives I use. I ended up applying a coat of polycrylic over the dark brown so that when I rubbed off the tan, the dark brown didn’t come off too. Then I was ready for the first coat of tan paint. After applying the paint I took a wet rag and carefully rubbed off the edges. 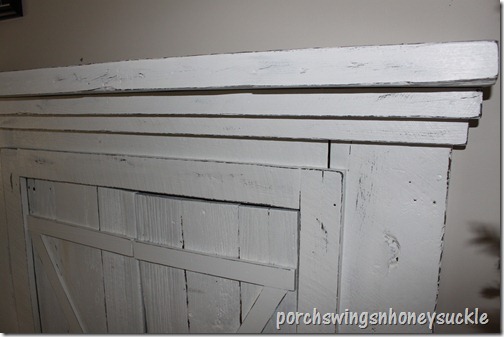 This works best to go section by section so the paint doesn’t get a chance to dry. Here is where you might want to consider investing in a sprayer. With the sprayer, I don’t need to apply the polycrylic in between the paints and the major time saver is I can get the cabinets covered with one coat of tan verses two with a roller. It takes a lot of time to rub the paint off the edges – especially when doing it twice! *Don’t rub too hard or the ugly orange(or whatever) will be exposed! I got this idea to spray inside toward the end of this project or I would certainly have used the sprayer for all the coats of paint! ( before, I had always thought it had to be done outside ) I set up a fan to blow any flying varnish out the window, donned my mask & sprayed away! I hope this post has been helpful to anyone who is ready for a fresh new look for their kitchen or a piece of furniture. Feel free to ask any questions… good luck!